This in Wednesday from the City of Everett regarding heavy snow loads on flat roofs. 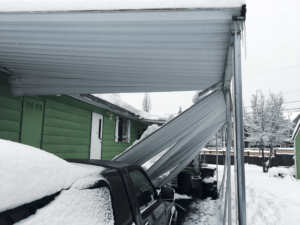 No injuries in this carport collapse on Tuesday. Everett Fire has had two reported incidents of carport failures due to snow load from the recent storms. The heavy snow creates concern about flat roofs with increased weight from snow. The City building official states that roofs built to code, under permit, and that have had routine maintenance and upkeep should be able to carry the weight of the snow in current conditions. Current City of Everett code requires roofs to be designed to carry 25 pounds per square foot, which exceeds minimum standards. Everett Fire, along with other City departments, continue to monitor the weather and associated risks. Citywide updates can be found at www.everettwa.gov/inclementweather.